Audrey's Blog: And This Is Fun? 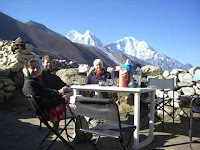 We reached 16,000 ft. yesterday afternoon as we crumbled into Lobuche, the sun brilliant on all the peaks . I had not a breath left and was horrified that I couldn’t hike better on the flat areas. But that’s altitude for you. No oxygen. No go. When we left Dengboche on a beautiful crisp morning, the first task was to climb straight up a high not well defined ridge. Whew. Then we had a long path incline on the side of a mountain where we passed the hairy yak trains and plenty of people doing the same thing I am doing, or at least returning back to sane country. Once again Jim had sent me out early with Nima, my Sherpa, and with as many rest stops as I take (short ones, though, and I get my wind back quickly), the rest of the group catches up. After crossing a river of boulders, we began a hideous climb upward to a tea house, the only one in the entire trek today. I was out of breath but the sun gave me some energy as did a Snickers bar. These rest houses are salvation for all trekkers - nothing fancy but a good menu to revitalize the organs and fill up with liquids. They have out houses, too, which I pray I don’t have to patronize. After about half an hour, it’s time to get back on the sticks and start the tedious long climb straight up through nothing but rock and boulders. 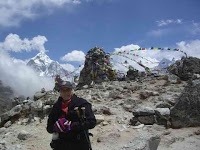 At the top of the steep climb is Chupilala, an area of chortens, memorials to Sherpas and climbers who have died in the mountains, including Everest. 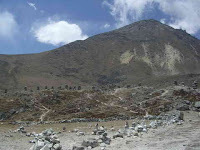 It’s the cremation site for Sherpas who die on Everest. Most of the chortens are stacks of rocks (reminds me of the old Jewish method of marking holy areas) that have certain shapes and orientation. On the way, we pass collections of Sherpas practically running down hill, getting time off because the government has declared no one can summit Everest until the 10th of May. They go back to their homes at lower altitude to get a burst of oxygen for a few days that will be beneficial during their summits. It amazes me how they dance down the trails. What takes me hours and hours of struggle will take them less than an hour of fast movement. It’s also warming that they all know Jim, an icon in the Himalayas, and stop for a round of questions about what’s going on. It took about five and a half hours to get to Lobuche, another small community with the typical red or green tin rooves, stone walls, and views that cannot be captured in photographs. When we arrived in the dining room, it was filled with adventurers from Britain preparing a documentary as a fundraiser for a famous climber to raise money for a cancer group. 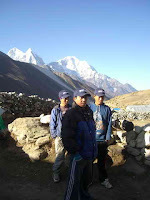 Their equipment is stored in one bedroom, and they actually stand outside in the freezing cold filming here because all cameras have been banned from Base Camp, where they had planned to make the documentary. So now they wait, like everyone else, for May 10th. We spread out on one of the rug covered benches and snacked on popcorn, cookies, chocolate bars and hot drinks. This is the norm, to get energy back. I could hardly sit up straight, but amazingly, I could breathe well. Once I get a chance to rest, my breath returns. I finally had to test out the OUTDOOR toilet, which was a horrible wooden thing - merely a hole - and I got winded getting up to it. Horrors. So I went to my room and warmed up under two heavy blankets and tried to get back energy and some rest in a horizontal position. It’s ice cold, mind you, because4 outdoors it is below freezing. The only warm spot is in the dining room where the stove is turned on that is the only warm spot. Get it while you can. This morning as I write with frozen fingers, avoiding the walk to the toilet, I can see my breath as I breathe, though I’m stuffed under the covers. All the cleansing I get is a face wash with the water still warm thats in the hot water bottle, and brush my teeth. It’s awful. But I just swallow it, not happily. Jim comes in, as he does each day, to check my blood pressure and heart beat. So far I’m healthy. It’s a good thing, Today we get to Gorek Shep, God willing, where we’ll be in range of base camp. Photos: Sherpas in Grizzlies caps at Dengboche; Outdoor breakfast; At the chortens at 16000 ft.; The chortens in honor of Sherpas and climbers killed on Everest.